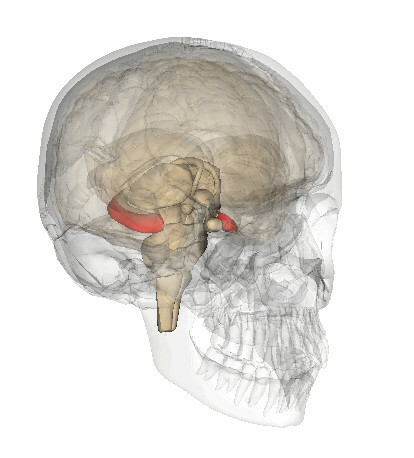 Figure 1, Location of the hippocampae (in red) in the human brain. The hippocampus is a brain component that plays a very important role in memory. We have two of them – as shown in Figure 1; one on the left side of the brain, and another on the right side. The hippocampus is a structure of much interest for the neuroscience community, partly due to its connection to Alzheimer’s disease. Alzheimer’s is the most common form of dementia, a disorder that is expected to affect over half a billion people in the next 40 years, and whose estimated total cost was over a hundred billion euros in 2010 in Europe alone. 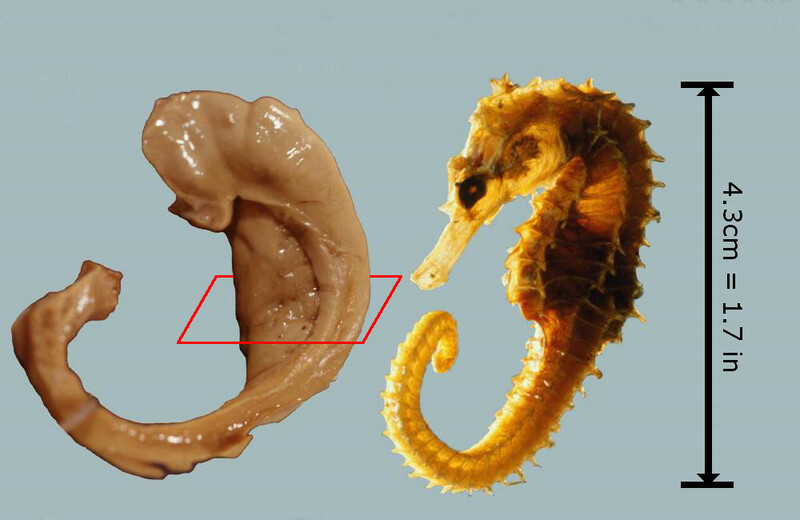 Figure 2, Images of a human hippocampus (left) and a seahorse (right), illustrating their similarity. The plane overlaid on the left-hand image illustrates the orientation of Figure 3. Hippocampus means “seahorse” in Greek, which is not surprising if we look at its shape. Even though it is hard to tell from the second figure, the hippocampus consists of a number of distinct, interacting sub regions, called the hippocampal subfields. If we slice the sample in Figure 2 in the direction of the red plane, it turns out that the hippocampus looks pretty much like a Swiss roll, as shown in Figure 3. If we follow the subfields – equivalent to following the jam in the roll – from the outside to the center, we first have the subiculum, where the hippocampus connects with the brain cortex, then the CA fields – 1 through 4, where “Cornu ammonis” stands for the horn of Amun, the Egyptian god – and finally the dentate gyrus. A study from Stanford University and a study from UCLA have shown that these subfields are involved in different memory subsystems, and that they interact with different regions of the cortex to make the brain work. Moreover, autopsy studies have shown that normal aging and Alzheimer’s disease affect these subfields very differently: whereas normal aging introduces just minor changes in the hippocampal structure, Alzheimer’s disease produces loss of volume (atrophy) in the hippocampus, with different subfields being affected to different extents. Figure 3: Analogy between a Swiss roll (left) and the internal structure of the hippocampus (right). These pictures illustrate a cross-section indicated by the red plane in Figure 2. The location of the subfields is indicated in the sketch on the right. Magnetic resonance imaging (MRI) is an innocuous technique that allows us to study the human hippocampus in vivo, that is, of living persons rather than autopsy samples. MRI allows us to track the morphology of the brain through normal aging or the development of neurological diseases. 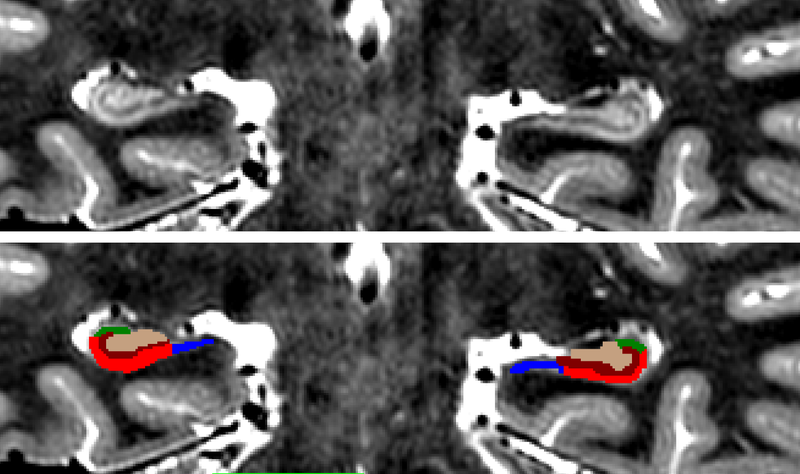 Unfortunately, the resolution of MRI scans has traditionally been insufficient to identify the subfields in the MRI images (see the image to the left of Figure 4 below). This eliminated the possibility of studying the individual subfields, forcing researchers to carry out studies of the whole hippocampus and to disregard valuable information on localized volume changes. However, with progress in MRI technology we are beginning to recognize subfields of the hippocampus, as seen on the right of Figure 4. Figure 4: Cross-section of the hippocampus using MRI imaging. Left: 1 mm resolution (standard). Right: 0.4 mm resolution (high). Certain subfields are marked to allow them to be related to the sketch in Figure 3. Pictures like the one on the right will allow us to localize the effect of Alzheimer’s and better characterize the progression of the disease. The eventual goal is to find a link between the early stages of Alzheimer’s and the size of subfields that are measured with MRI. This would potentially allow us to recognize the onset of Alzheimer’s and begin disease-modifying treatment before the disease has caused too much damage to the brain. Moreover, being able to visualize the subfields in vivo would also allow us to determine the effectiveness of treatment. Currently, clinical trials rely largely on neuro-psychological scores, that is, the results from interviews and pencil and paper tests. In-vivo imaging of the subfields would provide much more reliable metrics of success for drugs being tested and potentially decrease the time it takes to bring such drugs to market. One remaining challenge in carrying out this type of analysis is the extraction of information from the images. A simple, albeit time-consuming, method is for an expert neuroanatomist to manually label the subfields on the image. He or she would have to trace the boundaries of each subfield on each slice, as in Figure 5. Due to the 3D nature of MRI, where many 2D slices need to be analyzed, human inspection of the images is time-consuming. For instance, in the MRI scan of Figure 5, an expert would have to examine the hippocampus in approximately 150 cross-sectional slices in order to cover its anatomy from head to tail, a process that could take up to a full week for a single subject. Since a study typically consists of tens of subjects, manual analysis is limited to a handful of very specialized sites that have the expertise and manpower to carry out such an excruciating task. Even at these sites, the number of subjects in studies must be kept relatively low to maintain reasonable times. Figure 5: Cross-section of a high-resolution brain MRI scan, showing both hippocampae (top) and subfieldsthat have been delineated by hand (bottom). The MRI data used to generate this image are described in a scientific article. An alternative means of analyzing MRI images is to use computer programs that extract the hippocampal subfields automatically from the images. Some programs compare images to a database of manually labeled MRI images to determine the hippocampal structure. Others rely solely on statistical models that draw on the images to determine the most probable shape. Even though automated annotations are less reliable than those made by human experts, they allow us to carry out experiments at a much larger scale. This increased processing speed greatly increases our ability to detect the effects of Alzheimer’s or aging within large sample sizes. In the next 2-3 years, a vast number of high-resolution hippocampal MRI scans will have been collected. The enhanced resolution of these scans, together with newly developed image analysis software, will allow us to link morphological changes in the hippocampus to the onset of Alzheimer’s disease, and to the effectiveness of treatments for Alzheimer’s. High resolution imaging may well be a great step towards combatting Alzheimer’s. Juan Eugenio Iglesias is a 2007 fellow of the Fulbright Science & Technology Award Program, from Spain, and a Postdoctoral Fellow at the Martinos Center for Biomedical Imaging, Massachusetts General Hospital and Harvard Medical School.